This recipe can be adapted to suit what you have in the fridge. Stewing steak will work just as well as diced beef, just cut it yourself beforehand. If you’re planning to leave the slow cooker on while at work you could complete some these steps the night before and refrigerate your meat and veg before adding to the pot in the morning. Take the diced beef and coat with a handful of flour in a separate bowl along with a pinch of salt and pepper. Once the meat is fully coated place in the frying pan with the garlic and fry on high for a few minutes until the meat is brown. Empty the meat into your slow cooker and reduce the heat. Fry off your onions and chopped vegetables of choice for 5 minutes before again adding to the slow cooker. Mix the stock cube in 600ml of warm water. Add red wine or some of your stock and turn up the heat for a few minutes to clean, or ‘deglaze’, your pan. Deglaze is fancy word for getting all the brown bits off the bottom! Tip the contents into the slow cooker. Add the rest of your stock, red wine, a glug of Worcestershire sauce, or herbs like bay leaves of bouquet de garni that you might have in the cupboard. Put the slow cooker on high for 5 hours or low for 8. To make the dumplings mix 100 grams of suet with 50 grams of self-raising flour and roughly 5 tablespoons of water. You can add salt, parsley or thyme at this stage depending on your preference. Knead the dough with your hands until it is firm but pliable and shape into 8 balls of dough. Half an hour before you plan to eat your stew pop your dumpling balls on top and let them brown. 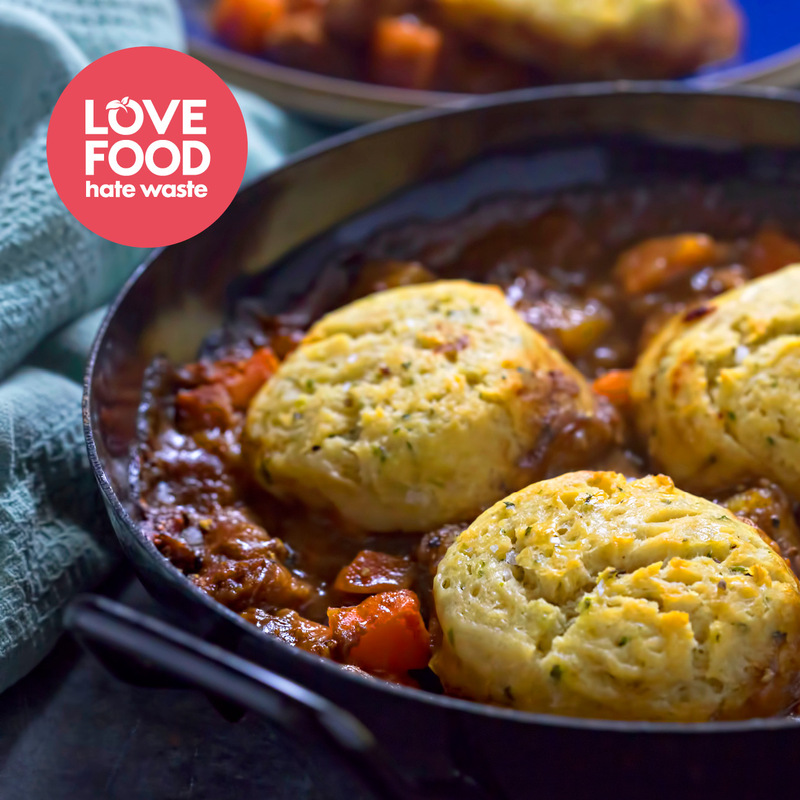 Serve the stew hot, we love it with mashed potato and peas. Cook’s tip: Other grains can be used – try couscous or brown rice. Choose apples with a tart, fresh flavour and pretty green or red skins.